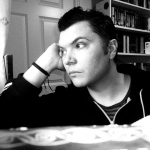 James Bennett is a writer of fantasy, horror and the occasional contemporary fable. Born in Loughborough, he was raised in a variety of places, from South Africa to Amsterdam. His debut novel ‘Unrequited’ was nominated by the Lambda Literary Foundation (US) for Best Debut Novel in 2007 and since then he has several short stories published in the UK and US independent press, some earning him further award nominations. In 2011, he won Best Horror Writer from Screaming Dreams Press. James Bennett’s darkly humorous mini-novella ‘Practical Devil Worship (For All the Family)’ was recently made available for Kindle on Amazon. The author currently lives in Leicester and is hard at work on a new contemporary fantasy novel.